The new couple moved back to Africa and settled in the town of Badagary in Lagos, Nigeria. Shortly after her marriage, Sarah Forbes Davies had her first daughter and requested for permission from Queen Victoria to name her Victoria. The Queen granted the permission and also adopted baby Victoria as her goddaughter. 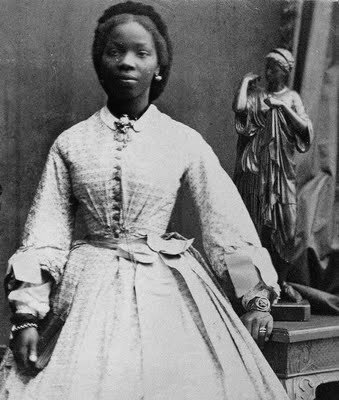 In 1867, Sarah and her daughter visited the Queen then returned to Lagos where she had two more children named Arthur and Stella. Sarah was diagonised with tuberculosis and later died on August 15, 1880 at the age of 37. She was buried in Funchal, Madiera Island, Portugal. It was such a sad moment for her family. Queen Victoria wrote in her diary, “ Saw poor Victoria Davies, my black godchild, who learnt this morning of the death of her dear mother ”. Queen Victoria took good care of Sarah’s children and maintained close contact with them. Till today, the decendants of James Labulo Davies and Sarah Forbes Bonetta Davies lived in England, Sierra Leone and Lagos, Nigeria. Contact Adeola Haruna (Dholaa) for your Art works today! I enjoyed reading this..thanks KFB!